"It doesn't bother me if my pet has 'dog breath', why should I have his teeth cleaned?" Bad breath is due to the pathogenic bacteria in your pet's mouth. These bacteria get into the bloodstream and lodge in heart valves, kidneys, and lungs where they cause damage, and can eventually result in death. Periodontal disease has been proven to shorten the lives of pets. Good dental hygiene is an essential part of helping your pet live a longer, healthier, happier life. "I'm afraid my pet is too old to be put under anesthesia?" The health risks associated with dental disease will greatly outweigh any anesthetic risks. Our anesthetic agent is Isoflurane gas which is very safe and widely used in human medicine. To further evaluate any risk factors we require pre-anesthetic bloodwork in all dogs 9 years or older, and cats 11 years or older. We do recommend that younger animals have smaller pre-screening testing to assess risks that we cannot find on a regular examination. All patients are monitored very closely both during the procedure and throughout recovery. We do not feel that any pet is "too old" to have a dental cleaning. "Once I decide to have my pet's teeth cleaned, how soon will it need to be done again?" 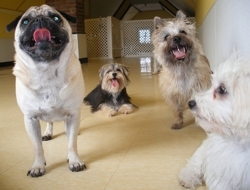 Your pet's breed, age, genetic makeup, and diet will play a part in how often they will need a dental cleaning. Smaller dogs, such as poodles and Chihuahuas, are predisposed to dental disease and may need cleanings more often than some other breeds. To help slow progression of dental disease we recommend feeding only dry food, and using Greenies treats. (Be sure to always supervise your pets and choose the appropriate size treat for your pet.) In some cases the doctor may recommend a dental diet such as Purina DH to help increase time between cleanings.